Have you been planning on writing and self publishing a book for long but just didn’t know how to go about it? or maybe you did, but lacked the self confidence. Whatever the reason, if you want to be a successful author & publisher, you need to get the basics right, and there’s no better person to lead and guide the way than Guy Kawasaki and Shawn Welch. 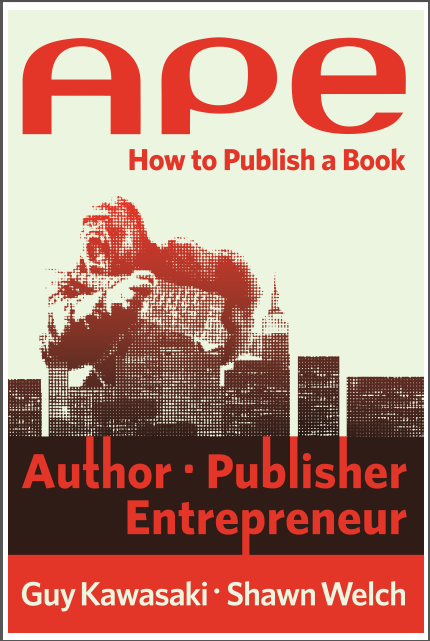 Their latest writing venture is called APE: How to publish a book (Author • Publisher • Entrepreneur) and is a fantastic guide to anyone inspired to write and self publish a book. Here’s my review of the self publisher’s bible, APE: How to publish a book. With thousands of ebooks being published everyday, you might think that self publishing is an easy job. You could just Google “how to publish a book”, print out a bunch of web pages, and start writing. Right? Wrong. APE sets the facts straight, so that you don’t live under the illusion that authoring, publishing and marketing a book is pretty straightforward stuff. For everyone who thinks, self publishing is all about writing your best stuff, and for everyone who hasn’t got a clue, APE is your bible. APE is unique in that it not only offers tips, tools, and how tos on self publishing , but also deep insights into what every author experiences in the process of writing, publishing and marketing a book and Guy draws on his own experiences while preparing you for it. APE may be a self help book, but as you go through the pages, you experience the ups and downs, the thoughts and emotions a self publisher goes through in the process of attaining the goal. This book will leave you inspired, confident, and ready to set out on your own writing journey, preparing you for both the best and worst of whats to come. What are the right reasons for writing a book? What are your chances at succeeding at traditional publishing? Is self publishing a more viable option? What are the tools you need for the job? How do you write and edit your book? How do you sell your book? These are just some of the many questions you ask yourself before you venture into writing and APE has all the answers. Plus there are over 400 links to resources you’ll need on your way to self publishing your book. And inspiring stories and quotations which will be your constant companion when in doubt. APE offers great attention to detail. Guy even explains how to use Microsoft Word to create your outline, set styles, and apply grammar and spelling options. He emphasizes heavily on the need for review and corrections, and sets your expectations for each task according to the realities of today’s publishing business. APE is exhaustive, over 300 pages long, and you may have to read it more than MANY times to fully understand and integrate its truths into your venture. But it’s written in such simple fluid, and entertaining style, you’ll never find it dreary or mind boggling. In fact, every turn of the page fills you with renewed vigor and inspiration. In APE, Guy continually emphasizes the importance of the Chicago Manual of Style and believes every wanna-be, would-be, could-be, or experienced author should own a copy of the book to be a successful author. I believe that alongside the Chicago Manual of Style, every wanna-be, would-be, could-be, or experienced author should also own APE. For you will not find a greater mentor, guide, and bible, as this one. APE is currently available only on Amazon for ninety days for a Kindle price of $9.99. Be sure to check it out! A special thank you to Guy for graciously offering a free copy of the book for my review. My post may not do justice to your book Guy, but I’m happy and proud to be part of your book promotion and share this review with my readers. May you continually inspire us with your ideas and vision.